A farmer, agri-businessman and life-long Iowan, Senator Ken Rozenboom was born and resides in Mahaska County. He is a graduate of Pella Christian High School and attended Calvin College in Michigan. After college, he returned home to farm with his father and brother before taking a position in sales and production management for Wake’s Inc., a local agricultural supplier where he worked for 30 years. He and his brother continue to operate Rosewood Farms, a family farming operation in rural Mahaska County. 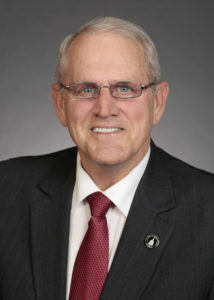 Senator Rozenboom’s public service began when he was elected to the Mahaska County Board of Supervisors where he served on the boards of the Eighth Judicial District Department of Correctional Services, Ten-Fifteen Transit Board, Central Iowa Detention Center, Area 15 Regional Planning Commission, and the AHEAD Regional Housing Trust Fund, along with other committee assignments. Besides his farm and family life, and Board of Supervisors work, Senator Rozenboom has served as an elder and deacon in the Bethel Christian Reformed Church and served several years on the board for the Oskaloosa Christian School. He served on community boards for many years, including a stint as chairman on two local agencies: the Human Services Resource Council, an organization that provides emergency needs for low income families, and the Christian Opportunity Center board, which provides residential and vocational services for special needs adults. Additionally, Senator Rozenboom is a member of the Mahaska County Farm Bureau. Senator Rozenboom is married, and he and his wife, Becky, have two children. Their daughter and son-in-law live in New South Wales, Australia, and have three children. Their adult son lives and works in Alaska.